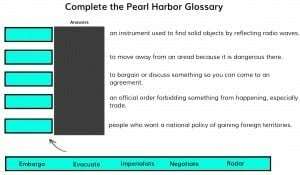 Ready to this lesson plan about Pearl Harbor Remembrance Day? 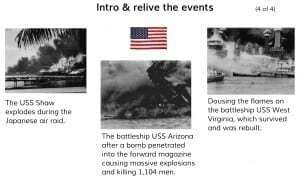 To commemorate Pearl Harbor Remembrance Day, we have a released a new lesson to help students understand that happened on that fateful day 73 years ago; and why it was so important to American, and world, history. This lesson is common-core aligned, and includes several readings and interactive activities on the subject. Students will experience the sequence of events of the attack on Pearl Harbor. They will analyze the events that led to the attack. They will use time lines to understand historical events as they relate to one another. They will become familiar with vocabulary associated with war and military combat. They will take a quiz. They will write a narrative using historical facts and personal opinions. To use this pre-made lesson plan click here! Many of your students may have never heard of Pearl Harbor. Change that with this new and informative lesson! The lesson starts with some reading material including a detailed timeline about what happened on December 7, 1941. It ends with a glossary game, and other activities to see what they’ve learned. The lesson starts with an introduction to the topic. Four slides with pictures and text tell the story of December 7th 1941 and relive the events. Why did the attack occur? Why did this attack occur? The next slide sums up the occasions that took place before the attack. Now, the lesson becomes interactive. 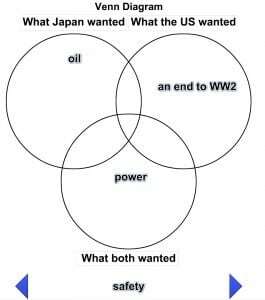 Student drag the words related to Pearl Harbor in the right circles of the Venn Diagram. A great tool to start an interactive discussion in your classroom. 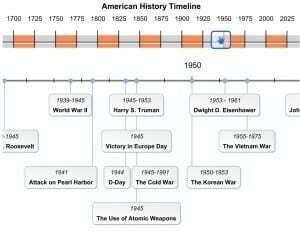 To teach how historical events are related to one another, use the American History Timeline. Play this educational game that helps students improve their vocabulary. Each sentence represents a word. Let your students drag the words to the correct gap. After filling the gaps, check the answers. Play an educational game to check your students’ knowledge. 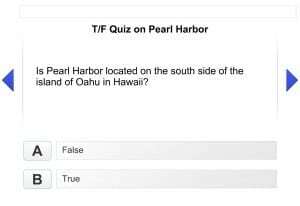 The lesson includes a fun true / false Quiz on Pearl Harbor. When the quiz has finished, you can check the answers and see which questions you answered correctly. 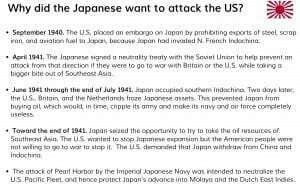 As a final assessment, let your students write a narrative based on the history facts of Pearl Harbor and let them use their own opinions and feelings to add to the account. Stimulate them to write a story that represents a person from either country. Do you like this interactive lesson plan? Click here to use it in your classroom!